Mobile broadband is a wireless technology that provides access to the internet via mobile devices. With the vast adoption of mobile phones worldwide, the mobile industry has not only changed in scale, but also in use. The number of mobile subscriptions worldwide is forecast to increase from around 8 billion in 2018 to more than 9 billion by 2022. 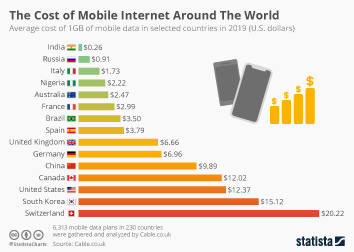 Asia Pacific is the leading region in regards to number of mobile subscriptions, with China and India accounting for the highest number of mobile-cellular telephone subscriptions in the world. The growing mobility has a direct impact on lifestyle, as it opens up areas of demand for mobility-related services, such as mobile broadband. The number of mobile broadband subscriptions has been on the rise since 2007 - there was an estimate number of 4.2 billion mobile broadband subscriptions in use worldwide in 2017, which is more than twice as many as in 2013. Again, the Asia Pacific region has the highest number of mobile broadband subscriptions, while Europe and the Americas have the highest number of mobile-broadband subscriptions per 100 inhabitants. Within the mobile industry, there are different technologies which are directly related to both network and broadband access. Today the most widely used mobile broadband technology is LTE (4G). In 2018, 40 percent of all mobile broadband connections worldwide are using the LTE (4G) technology. The other two mobile broadband technologies that are widely used today are HSPA and GSM. The market share of GSM and HSPA is forecast to decrease over the next few years as the LTE technology is projected to grow further and make up around 60 percent of the market by 2022. By that time the new generation mobile broadband technology 5G is also expected to be released to the market and account for about four percent of mobile broadband connections. More interesting topics from the industry "Technology & Telecommunications"